As land masses go, the Galápagos Islands are not very old. A little over four million years ago there was open ocean where they now lie, on the equator some 600 miles west of Ecuador. But submarine volcanic activity slowly built up the string of islands that Darwin visited in 1835. Indeed, it was Darwin who first recognized their volcanic origin, and who understood the profound implications of this origin for the history of life. For if the islands were volcanic, they must have formed after the creation of the world, and the organisms living there must have migrated there from someplace else. But since those organisms are found nowhere else, Darwin finally had to conclude that they had evolved there from South American ancestors. After Darwin's visit, and well into this century, the origin of the islands have been disputed. Many thought that they had once been part of the mainland, or connected to it by a land bridge. 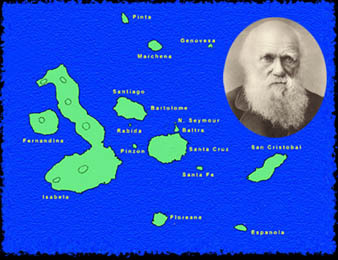 Eventually, however, Darwin was vindicated; these islands had a volcanic origin separate from the mainlaind and were never connected to it.